CAN Automotion announces the launch of three new industrial Ethernet products by IXXAT. The products are due for release in April 2013. A powerful and easily configurable gateway for connecting CANopen devices and networks to PROFINET systems, the COP-CON 220/PN gateway enables bi-directional data exchange allowing for both the integration of existing, low-cost CANopen devices into PROFINET systems as well as the provision of data from PROFINET for use in CANopen. 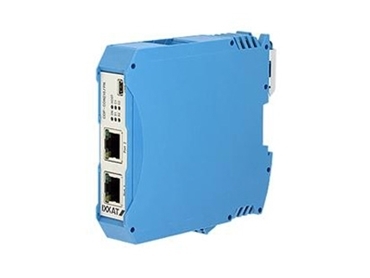 The gateway operates as a PROFINET I/O device and uses slots and sub-slots for data exchange. On the CANopen side, the device acts as a CANopen NMT master with PDO and SDO support. The gateway configuration is accomplished easily by using the IXXAT configuration tool. An integrated 2-port switch in the gateway allows easy integration into line topologies. The connection to the CANopen bus and the power supply is made using screw terminals. Device configuration and firmware upgrades can be made via a USB 2.0 port. The IXXEC-100 is a powerful and extremely flexible EtherCAT Master solution for DIN rail mounting available at a very compelling price. The EtherCAT Master functionality is provided using the proven protocol software from Acontis for EtherCAT Master Class A and B devices. A specially optimised link layer allows the IXXEC-100 to operate with cycle times of less than 1 ms. The selected EtherCAT Master implementation, as well as the included drivers and the Linux operating system, enable the fast implementation of customised EtherCAT applications and rapid adoption of existing applications to the compact and powerful IXXEC-100. The IXXEC-100 has been designed to meet the requirements of a range of applications, and therefore features a fanless design, an extended temperature range from -40°C to + 70°C, and enough power and interfaces to become an optimal solution. The basic version of the device has four Ethernet interfaces, two CAN interfaces and two USB ports, and uses a dual core Cortex A9 CPU. The internal RAM memory has a standard size of 256 MB and can be extended up to 1 GB. Operating system and programs are stored in flash memory on an SD card. The IXXEC-100 provides a remarkably high degree of flexibility by using a unique combination of interfaces, FPGA, software and services, making it an ideal platform for application-optimised and customer specific solutions. Besides the version within the robust metal housing, IXXAT offers the IXXEC-100 as a board-level product for space-saving integration into already existing customer applications. The EtherCAT I/O Module ETCio 100 enables quick and easy connection of analogue and digital input and output signals to EtherCAT systems in component test stands, mobile applications as well as industrial automation applications. The embedded board version can be easily integrated in customer-specific devices. Additionally, customised versions with custom I/O interfaces, individual form factors or connectors can be developed by IXXAT in a short time and at competitive prices. The device has two analogue inputs and four analogue outputs with a 12-bit resolution. The analogue output voltage range can be individually programmed in a 0-10 V range. Six digital inputs and four digital outputs are also provided. The module is configured by the EtherCAT master device by writing EtherCAT objects.